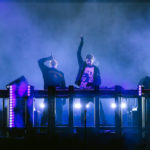 Dada Life have had quite the week last week with their alleged marketing stunt Dada Death making it out to seem like a fan was holding their laptop full of unreleased tunes hostage. Though the stunt flopped pretty hard as it didn’t last more than a day or two, outside of all the TMZ-esque moves a new remix of their recent single “Freaks Have More Fun” has surfaced from a young Brazilian producer by the name of JAKKO. Trading in Dada’s grittier electro sounds for a more aggressive and melodic synth pack, JAKKO keeps the original’s vocals robotic while building up enough tension to explode a grenade through elevating yet destructive synths. Although progressive house is one of dance music’s more popular genres, JAKKO keeps his remix fresh and ear-appeasing for fans, enticing them to keep a close eye on him in the future.